United 16 Impact MP4 USB week 1 is a talk recorded at New Wine - 2016 on Multiple Teaching Themes available as USB Stick format. The teaching on video from Impact at New Wine United National Gatherings 2016 Week 1 in MP4 format on a USB stick for use in your computer or with a smart TV. 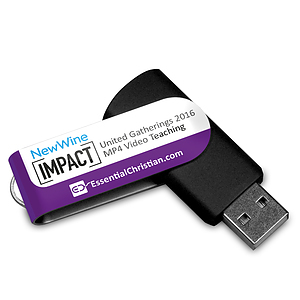 Be the first to review United 16 Impact MP4 USB week 1 a talk from New Wine! Got a question? No problem! Just click here to ask us about United 16 Impact MP4 USB week 1 a talk from New Wine. It says in MP4 format does this mean it is video as well as the audio? I hope to use it in my small group so hoping its both. A:The MP4 Formats are video recordings of the talks at the events. Thank you for using the Q&A Forum.